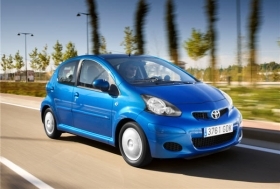 Production of the Toyota Aygo was hit by the ending of scrappage incentives in Europe. PRAGUE -- Toyota Peugeot Citroen Automobile expects to increase production next year. Pretax profit at the joint venture, formed by Toyota Motor Corp. and PSA/Peugeot-Citroen, was little changed last year as cost cuts helped to offset a production decline. "We managed to maintain good financial results even though the number of vehicles produced fell 11 percent as scrapping incentives ended," TPCA President Satosi Tacihara said at a press conference in Prague on Wednesday. The company expects a return to production growth in 2012, the executive said. The pretax figure was "just under" 1.4 billion koruna ($81 million), compared with 1.4 billion koruna in 2009, the carmaker, based in Kolin, Czech Republic, said. Revenue declined 16 percent to 44.7 billion koruna. The joint venture makes the Toyota Aygo, Peugeot 107 and Citroen C1 minicars, an area of the market least affected by the global slowdown. The company was hit last year by the end of scrapping incentives in some European Union countries. TPCA's factory assembled 295,712 vehicles last year, 11 percent fewer than in 2009, the company said in a statement. It expects to produce a similar number this year, Tacihara said at the press conference. The venture has no difficulties with suppliers as a result of the Japanese earthquake "at this moment," according to Tacihara. The situation is monitored continuously, he said.